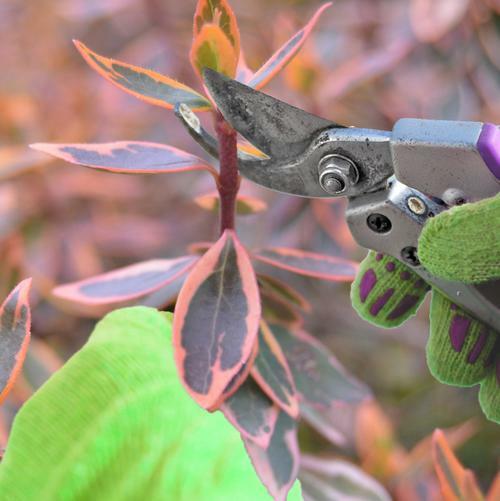 Pruning can make plants more beautiful, increase flowering, provide for stronger limbs and growth, and can help in maintaining preferred size. Some plants may need to be pruned each year while other may never require pruning. Knowing when and how to prune is important for long-term success with any plant. Pruning, in general, should be done before new growth appears and warm weather begins so the plants will be less susceptible to disease and so that the stored plant energy from the winter can focus on new growth and flowers. When pruning in late winter/early spring, remove any part of the plant that looks diseased, remove dead twigs and branches, and trim off suckers from the base of the plant. Pruning for flowering shrubs should be based on when the plant flowers and whether it flowers on new wood/stems or old wood/stems. Early spring flowering shrubs bloom on old wood/stems and should be pruned just after their flowering season so that summer growth will produce a more abundantly and support the next early spring flowering. Summer flowering shrubs should be pruned in late winter or early spring before they begin to bud and grow. The flowers for these plants appear on newly grown stems and this pruning encourages more stem growth and therefore more flowering in summer to fall. Heading cuts: This type of cuts shortens a branch or stem but doesn’t remove it entirely. Cutting off the dead flowers and foliage keeps the plant in good appearance and promotes the production of new flowers in the same season. Pinching: This action can be either a heading or thinning cut. Usually, you pinch soft growth between your thumb and forefinger. Pinching is handy with soft annuals and perennials, but also good for larger plants, if you do it early enough when their shoots are still young and soft. Any pruning done at this early stage is ideal because the plant suffers minimal harm and recovery is quick. Shearing: For this cut, use scissor like pruning shears to keep hedge lines straight and neat. Boxwood and yews are commonly sheared.